​Nearly 15,000 crashes involving a distracted driver (PDF) were reported in Pennsylvania in 2015. Of those, 61 were fatal. Nationwide, 3,477 people were killed in crashes involving distracted drivers. Research by the National Highway Traffic Safety Administration (NHTSA) found that, during daylight hours, approximately 660,000 drivers are using cellphones while driving. But not you, right? You don't ever use a cellphone while behind the wheel. The truth is, anything that causes you to take your attention away from driving, take your eyes off the road, or take your hands off the wheel is a distraction. Sure, cellphones are a good chunk of the problem these days, but distracted driving also includes eating and drinking, flipping through the radio, and chatting with passengers. Even rubbernecking — you know, when you just can't take your eyes off that crash scene you are passing — is distracted driving. 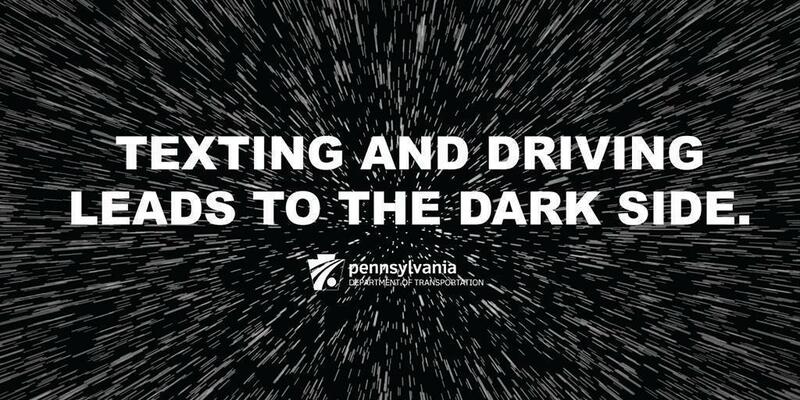 In Pennsylvania, we have a texting-while-driving ban — established in 2012 — that prohibits drivers from using cellphones and other devices to send texts, instant messages, emails, or browsing the internet while driving. This is considered a primary offense, which means you can be pulled over solely for the reason of using a device for electronic communications, and comes with a $50 fine, if convicted. Additionally, in November 2016, Governor Tom Wolf signed "Daniel's Law," which enhances the penalties for an accident caused by texting while driving resulting in serious bodily injury or death. Under the law, drivers who text and cause a fatality will receive a five-year jail sentence; drivers who cause bodily injury while texting and driving will receive a two-year jail sentence. April is National Distracted Driving Awareness Month — a time when PennDOT and organizations around the country focus on reminding drivers to put the phone down, remove distractions, and just drive. NHTSA offers several suggestions for ways you can get involved, including sharing messages on social media, leading by example, and spreading the word at school. You can also take the pledge to not drive distracted via AT&T's It Can Wait campaign, or download the AT&T DriveMode App to minimize distractions while driving.